Tremco Dymonic FC polyurethane sealant sausages are low-modulus, one-component, moisture-cure, polyurethane hybrid sealants. Dymonic FC polyurethane caulk is comprised of a branded silane end-capped polymer technology. Tremco Dymonic FC offers the "best of the best" performance qualities of polyurethane and silicone sealants. Dymonic FC is a tough yet pliable polyurethane sealant that offers outstanding performance when moving joints are present and also provides excellent adhesion to the substrate once fully cured. The most typical applications for Tremco Dymonic FC polyurethane sealer include expansion and control joints, precast concrete panel joints, perimeter caulking for doors, panels and windows as well as aluminum, masonry and vinyl siding. This urethane sealant product will cure quickly with a skin time of only 60 minutes and a tack-free time of 3-4 hours which will reduce contaminant pickup considerably. Tremco Dymonic FC polyurethane sealants will not crack due to early movement of the construction material it was applied to and has a remarkable movement capability of ± 35%. 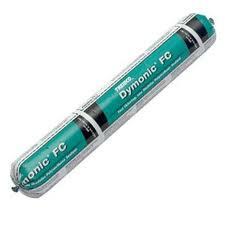 Dymonic FC is a low-VOC (Volatile Organic Compound), is paintable and will not crack or craze under tough UV exposure. Fire-Rated Systems FF-D-1063, FW-D-1059, HW-D-1054, WW-D-1054. Notes: Not recommended for underwater applications.